It’s time for the Aero India Show! Started in 1996, this will be the 12th Aero Show to be hosted in Bengaluru. The air show is considered to be the largest such show across Asia and is organized once every two years. The event is being organized by the Defence Ministry of India, Defence Research and Development Organisation (DRDO), Indian Air Force, Department of Space and the Union Civil Aviation Ministry. With its tagline, ‘Runway to a Billion Opportunities’, the show is aimed at bolstering business in the international aviation sector and providing a platform to showcase India’s aeronautical advancements. For this year’s exhibition, the logo has been inspired by the Tejas Light Combat Aircraft (LCA). 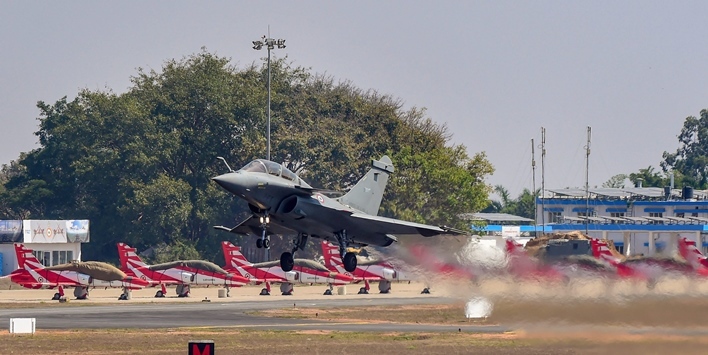 Bengaluru: French aircraft Rafale takes off during the inauguration of the 12th edition of AERO India 2019 air show at Yelahanka airbase in Bengaluru, Wednesday, Feb 20, 2019. At the last Aero Show organized in 2017, more than 1 lac people visited the event. This was in addition to the 60,000 business visitors. All visitors may register for the show online at the AeroIndia website. General visitor tickets are priced at Rs 1,800 per day for Indians and USD35 for foreigners. If you would like to see only the aeronautical display, air display tickets may be bought for Rs 600 and USD25 for Indians and foreigners respectively. These tickets do not allow the holder to enter the exhibition area where the aircraft are on display. Per day business tickets are priced at Rs 2,750 for Indians and USD50 for foreigners. These tickets are non-transferrable and non-refundable. All visitors are expected to dress formally. Aero India Show 2019 – What Can You Expect to See? This year’s Aero Show will see 363 exhibitors from around the world. There will also be 50 new aircraft on display. This is the highest number of aircraft displayed at the event so far. A number of events are being planned along with the aircraft display. The Aero India Show is the perfect showcase platform for aviation startups. The Start-Up will tap into this pool of talented entrepreneurs and give them the opportunity to interact with key policymakers in the Indian Defence sector. This event will give aeronautical students a chance to showcase projects they have been working on. Awards for the photography competitions will also be given out. An event is being organized to showcase the achievements made by Indian women in the aeronautical industry. A brochure highlighting these achievements will be launched and many women achievers will be felicitated. Female pilots and paratroopers will also put on an exciting flying display and share their experiences. Winners of several contests being organized by the show will be felicitated and an exciting aerobatic display will mark the culmination of the 4 day-long events. As a result of the Aero Show, bus/cab service may be disrupted at the Kempegowda International Airport for the duration of the show. It is advisable to check for road diversions and flight rescheduling if one is traveling between February 20th and 24th.